My first automotive experience in Australia was about to start thanks to Mark. Although I was somewhat concerned. I had been led through roads that I could only call the backroads of the backroads. I was by my little old self with a few thousand dollars worth of photography gear sitting helplessly in the back of my tiny rental car. Luckily for me everything was legit and I didn’t get rolled over in the middle of no where in a foreign country… yay! Mark turned out to be a really genuine guy and when I turned up he had not one but two drift ready cars waiting patiently for me. As we had rain both days of shooting in Australia, I tried to run around with my little umbrella to protect my gear from water damage. As you could imagine I only had two arms so this plan didn’t work too well for me. 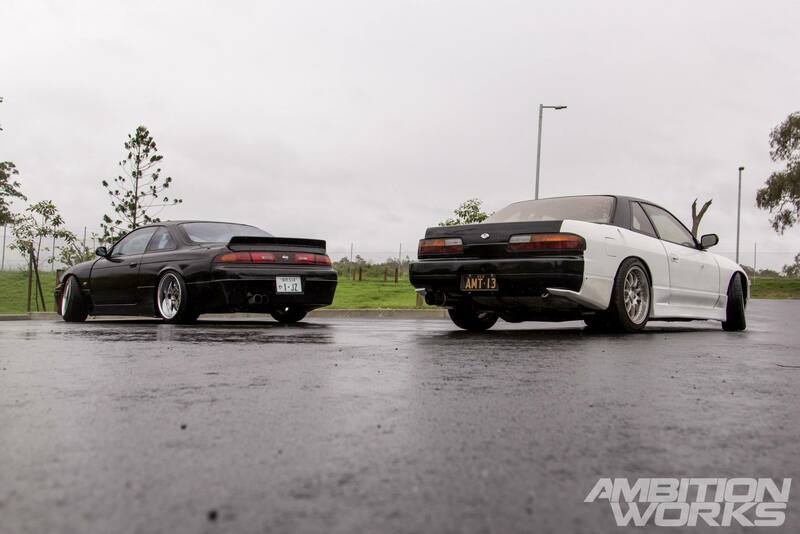 What you see here is Mark’s 96 Nissan Silvia S14 and Aaron’s 89 Nissan Silvia S13 both with rad engine conversions. 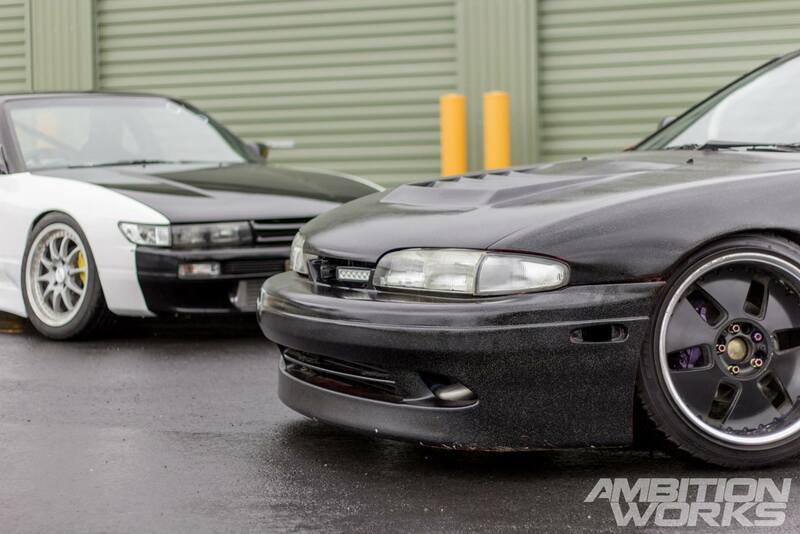 Unfortunately what the photos couldn’t show was the thousands of little glitter specs dashed through the black paint on the S14. The sun was hidden behind the clouds and sadly so was the glitter. I’ve experimented with photoshoots with two cars but usually this just ends up with the noses pointed in on each other. So today we stuck with the same theme but pushed the S13 back a little bit to try and gain shoots that wouldn’t be possible with the previously used setup. As Mark followed my very bad parking directions, I went and unpacked my camera gear for the first overseas shoot I was about to take. I didn’t have any external lights and the sun stayed hidden for the whole shoot. This meant improvising or bumping up the ISO a 100 or two. 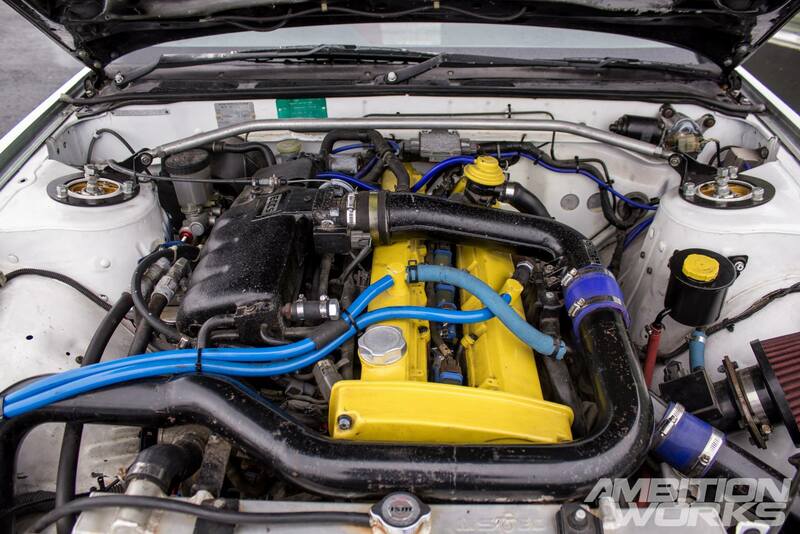 1JZ VVTI engine conversion that puts out a hot 370 horsepower from the rear wheels. This example of a 1JZ is fitted with a hi flowed turbo, BPP fuel fail, ID 1000 injectors and to control everything an APEXi power FC ECU. With the ECU, Mark now runs the car on E85. Luckily for you Australian folk E85 is available at a few select public petrol stations. 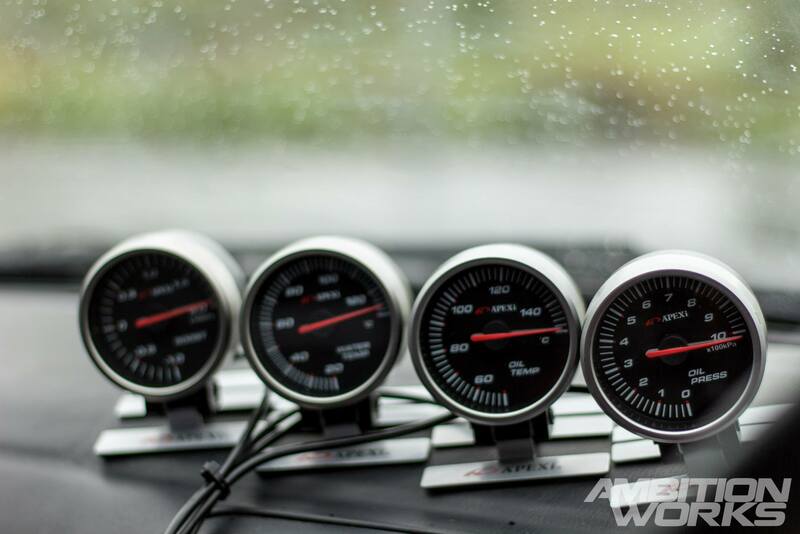 Moving inside the car we can see a full set of four APEXi gauges. These keep an eye on oil temp, oil pressure, water temp and lets not forget BOOST. 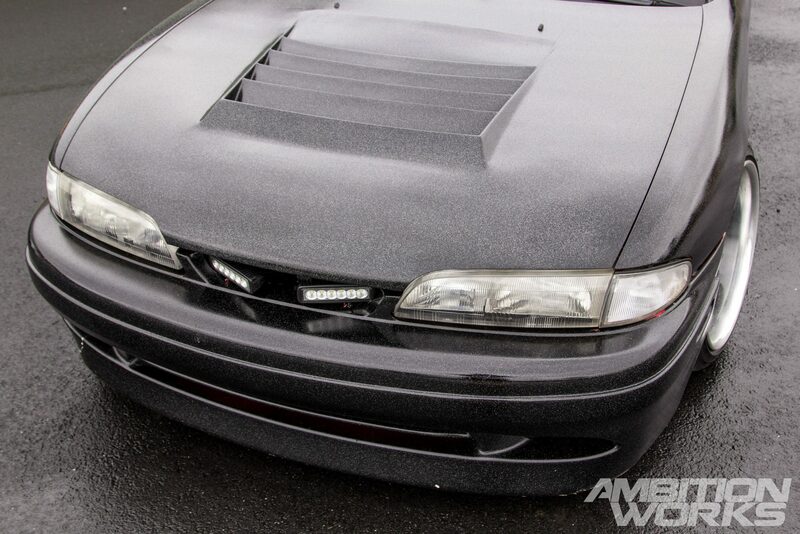 Mark must like APEXi products because he also has a AVCR Boost Controller supplied again by APEXi. Along with the gauges, installed is a Sparco quick release kit to help pilots exit from the Bride low max seat. Connected to all four hubs sit SSR Vienna Kreis wheels, with a lot of dish. Fitting nicely in the rear sits 18×10 +25. Mark has the same sized Viennas sitting up front too! Along with the DBA slotted rotors up front, the wheels are wrapped in 235/45/18 Rotalla 9s all round to transfer the stopping power to the ground. Currently sitting on D2 coilovers, the car has an assortment of other goodies hidden underneath that body. Sporting Kays Fabrication extended LCAs and modded knuckles, a full set of adjustable suspension arms and Whiteline front and rear sway bars to stop unwanted body roll. A nice finishing touch to the rear of the Silvia, because sometimes they can look a bit bland, is a genuine Rocket Bunny spoiler. Another accessory that fits so well with the rounded body of the Zenki Silvias. 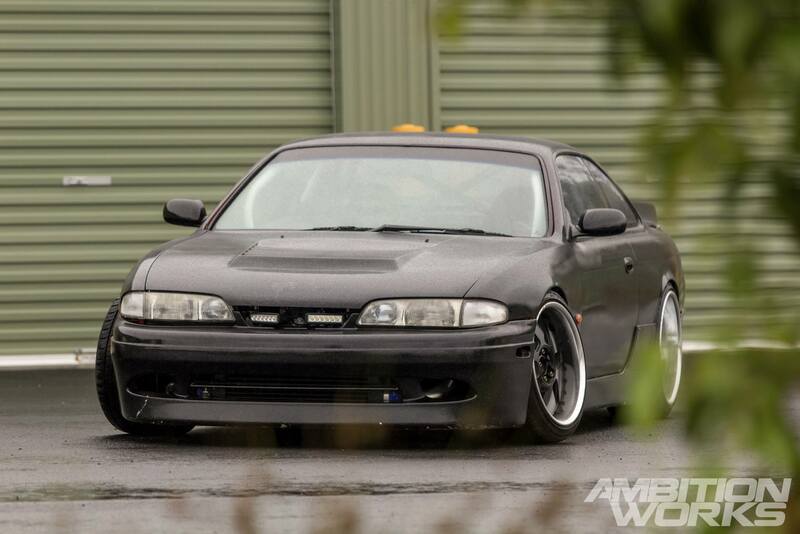 Along with Mark’s S14 we probably shouldn’t leave out Aarons S13 now should we. 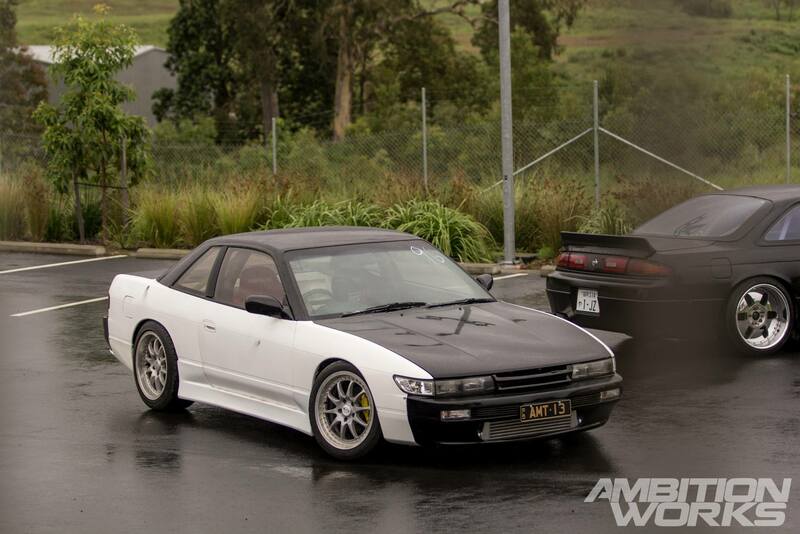 Aaron has kept with the original body of the S13 with just a few little alterations and a black and white paint scheme. 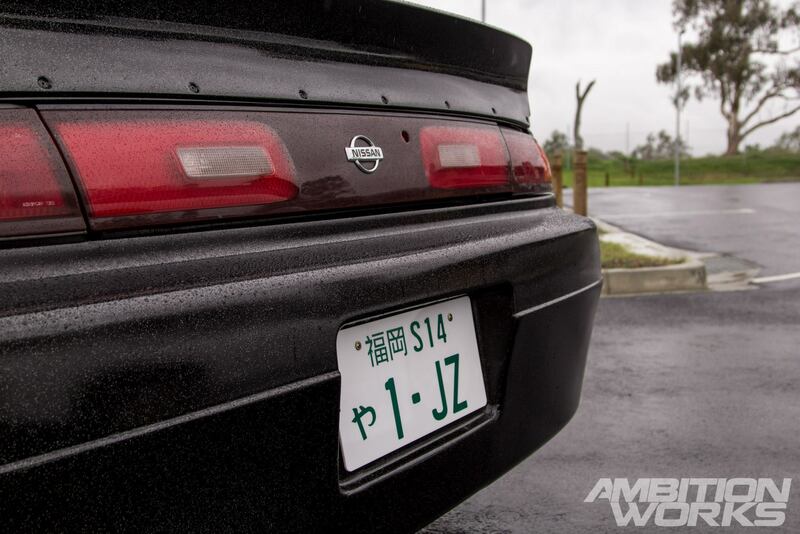 He had fitted Nismo styled end caps and side skirts to add to the already gorgeous look of the S13 Silvia. Unfortunately Aaron wasn’t able to personally make it to the photoshoot. However it’s amazing how you can get an idea of what a person is like just from looking at their automobile. 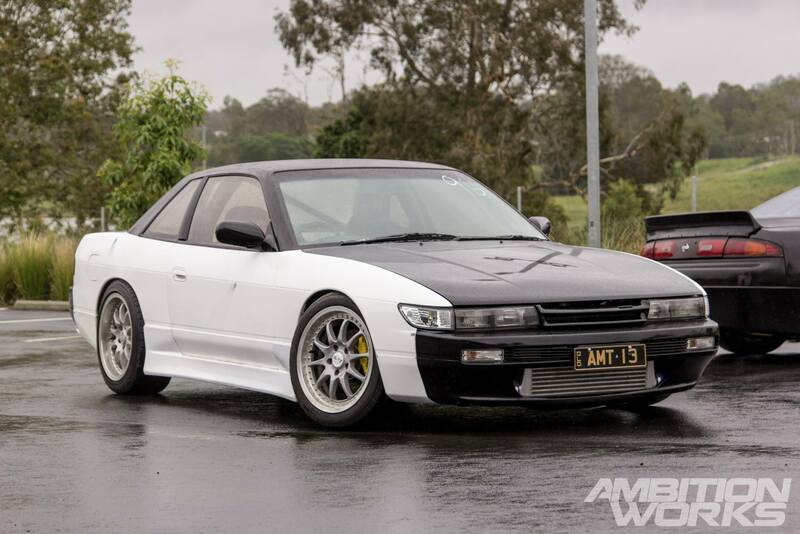 The S13 puts the power to the wheels with an RB20DET 5 speed gearbox. Any guess to the engine now? A lightened flywheel, a PUK clutch and some nice and strong braided clutch lines to make sure everything has enough fluid to do what it needs to do. Opening the hood and we can see the RB20DET that matches up to the previously mentioned gearbox. 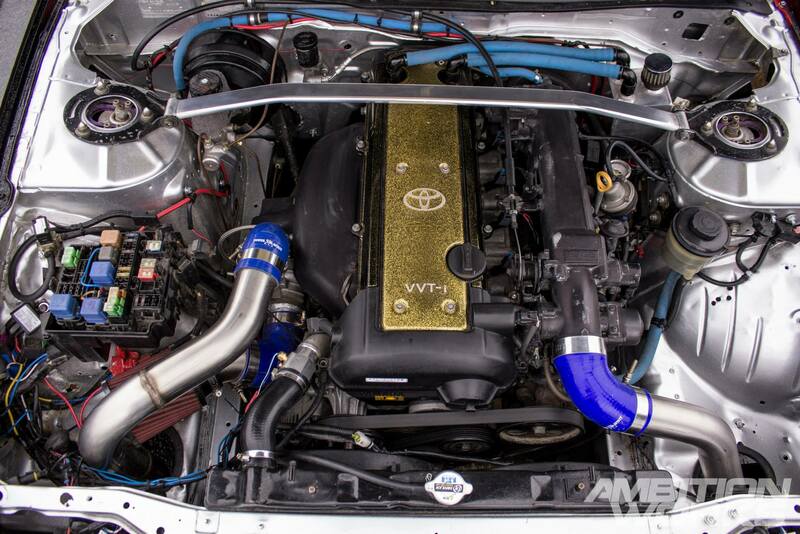 It has a few basic drift mods including a front mount intercooler with a 3” turbo back exhaust. Oil relocation kit and oil cooler. Changing out the original coil packs and replacing them with Splitfire coils packs along with a Blitz ECU to tell everything what to do and keep it under control. Aaron has really focused on the suspension of this car. 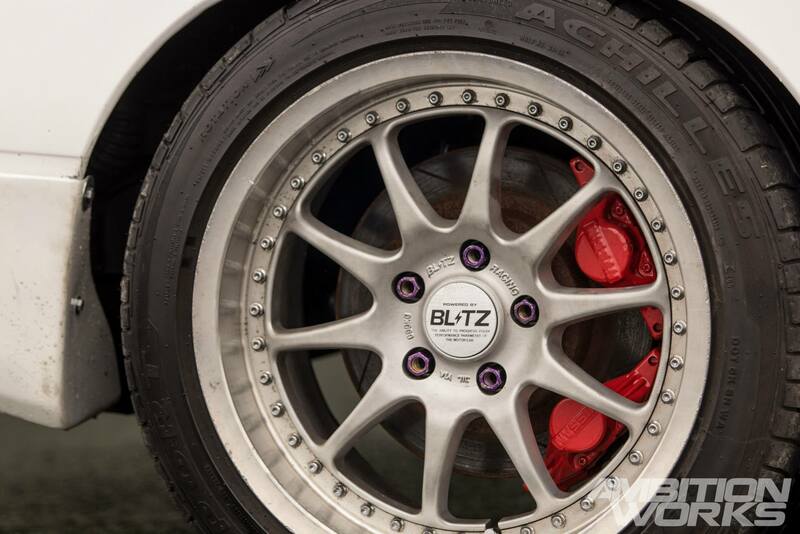 The rear brakes feature twin calipers and R32 rotors. With braided brake lines and a GTR brake master cylinder it would be easy to slow down the 250 horsepower produced by the Skyline engine. Covering the brakes are a set of Blitz wheels, measuring 8 inches at the front and 9 at the rear. 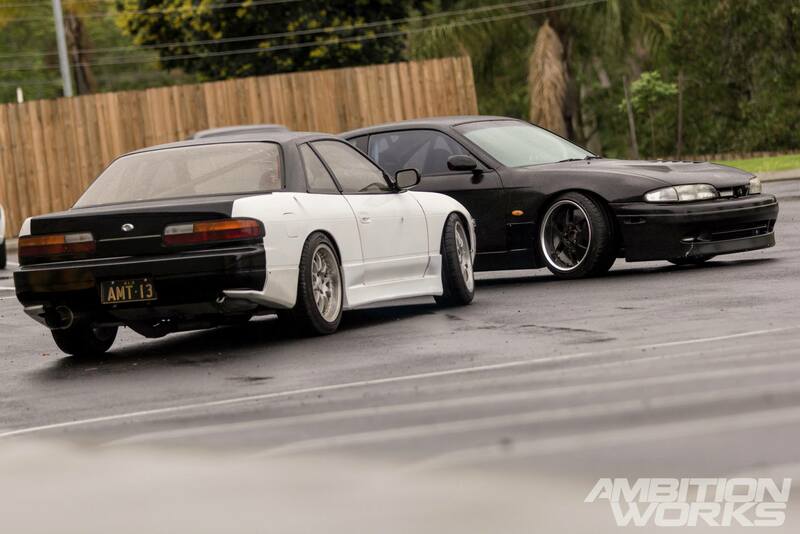 We all know that Silvia chassis are already rather stiff. We’ll add coilovers to the mix and you can have a very bumper ride. 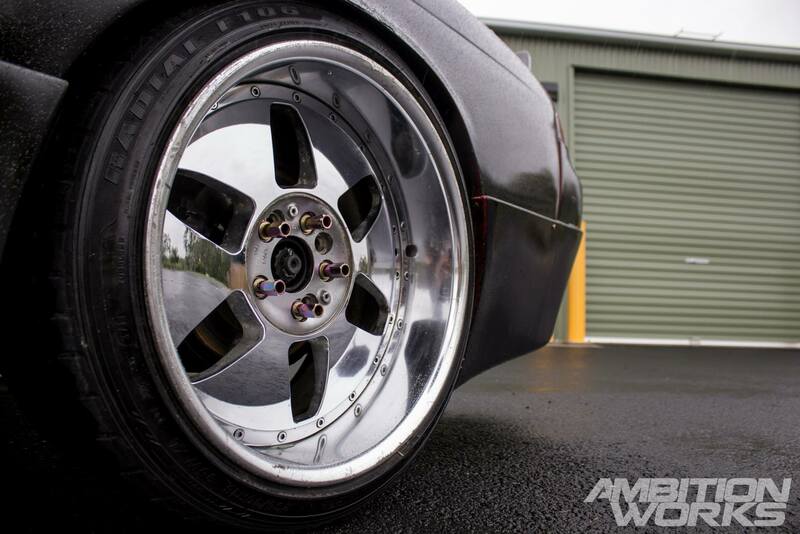 Aaron however has added a whole christmas list of suspension components to this lucky S13. Featuring a full set of adjustable suspension arms, custom trunk brace, fender braces, and front and rear strut braces. Along with the new suspension components, the front knuckles, LCAs and crossmember have been modified. With the addition of an alloy steering spacer there is no argument that this S13 is set up to utilise all of the available 250 horsepower. That was it, my first time feeling like a somewhat dignified photographer. Not looking like a road cone or running for my life when cars come flying at me or dodging the constant flow of debris. 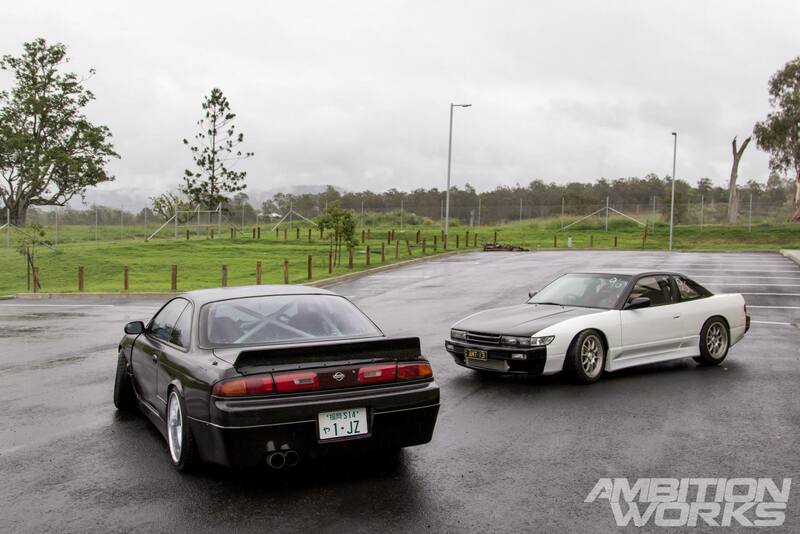 Despite the bad weather it was a pleasure shooting two Japanese made Australian modified drift cars. A thank you to Mark is in order for finding a location and another car to make my first shoot one to remember for a long time. Thank you Mark and Aaron!